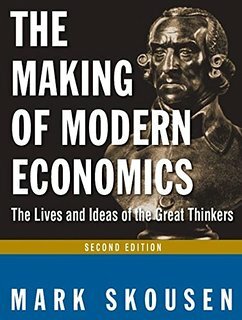 Here is a bold history of economics – the dramatic story of how the great economic thinkers built today’s rigorous social science. Noted financial writer and economist Mark Skousen has revised and updated this popular work to provide more material on Adam Smith and Karl Marx, and expanded coverage of Joseph Stiglitz, ‘imperfect’ markets, and behavioral economics.This comprehensive, yet accessible introduction to the major economic philosophers of the past 225 years begins with Adam Smith and continues through the present day. The text examines the contributions made by each individual to our understanding of the role of the economist, the science of economics, and economic theory. To make the work more engaging, boxes in each chapter highlight little-known – and often amusing – facts about the economists’ personal lives that affected their work. This entry was posted in Books and tagged mark skousen, modern economics. Bookmark the permalink.